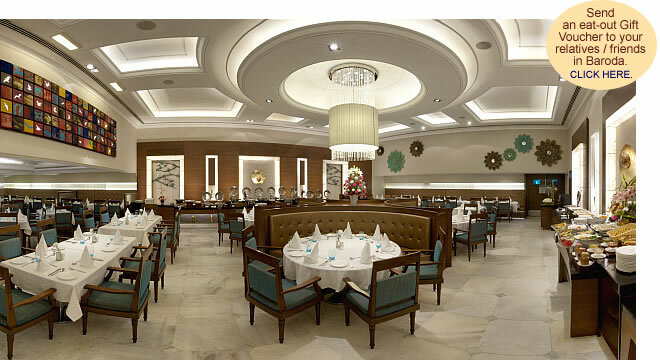 Dining at Grand Mercure Vadodara Surya Palace is a treat for the senses. The flavours. The aromas. The live cooking. And the artistic display. All come together in fine harmony to pamper your palette and satiate your soul. From authentic ethnic to the experimental exotic, the focus is on creating experiential dining. An 'International Food Theatre', Azure is a gourmet's delight. From Kashmiri gravies to Thai curries, from Delhi kababs to Lebanese falafels, from Chinese soups to Hyderabadi shorbas - we serve the world on your platter. Food festivals at Grand Mercure Vadodara Surya Palace are really foodies festivals. They are a celebration of culinary skills, choicest ingredients, traditional recipes, contemporary explorations, and complimenting ambience. Master Chefs from Indian and International kitchens are invited to make Vadodara their home for 2 weeks wherein they not only conjure their specialities but also interact with the diners and share with them the finer nuances of each dish. Those with a sweet tooth can indulge at Vanilla, our in-house patisserie which offers melt-in-mouth cakes, soft-like-never-before pastries, fresh-from-the-oven breads, very-very-french baguettes and beyond. Wedding cakes, birthday cakes, gourmet cakes, or cup cakes - just choose your pick and get set for a celebration to remember. From Delhi's Chaats & Chennai's Dosas for starters to Kolkata's Rasogullas & Rajasthan's kulfi to satiate your sweet tooth, your wish is our menu. Be it mindful conventions or hearty celebrations - our banquet buffets are customised to the occasion. Indian, Italian or both; three course, five course or eight course - we are adept in multiple cuisines and multiple courses. Shaadi specials, conference classics or new year favourites, we are the specialists in customising the menus as per the occasion and taste of the client. Our F&B and hospitality team promise impeccable cuisine and flawless service. No matter how small or large the occasion, our outdoors catering service is an experience to relish and reminisce.